What is Cold Mix Permanent Patching? | ACI ASPHALT & CONCRETE INC.
What is Cold Mix Permanent Patching? Permanent patching is a type of environmentally-friendly pavement repair that involves using a high performance cold patch asphalt mix. Continue reading to learn more about cold asphalt permanent pavement repair, including when and where it can be applied. 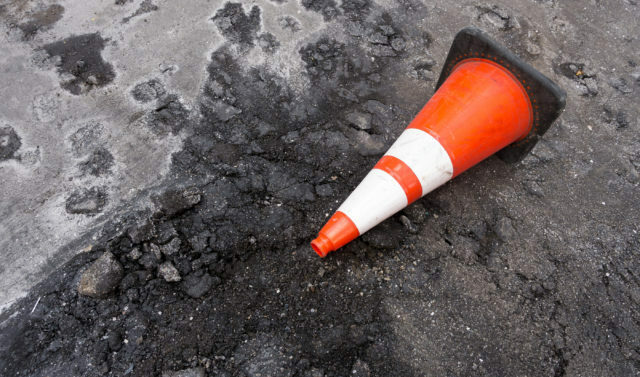 Permanent patching material is most commonly used to fill potholes. It is very high performance, which allows it to be used all year long, in virtually all average outdoor temperatures. It comes in 3 different grades for each significant season we experience here in Indiana. There is a specially formulated winter grade for temperatures of 40 degrees Fahrenheit or below, a spring and fall grade for temperatures between 40 and 60 degrees Fahrenheit, and a summer mix for temperatures between 60 and 80 degrees Fahrenheit. Permanent patching cold asphalt mix comes with a wide variety of features that makes it a great option for year-round pothole remediation. Not only can it be used year round because it comes in 3 flexible grades, it is also an all-weather product that is suitable in both wet and dry conditions. Furthermore, cold asphalt mix is a permanent solution to potholes, which means it lasts substantially longer than all other pavement patching materials. Best of all, installation is generally quick and simple. Permanent patching cold asphalt material is ready to use since it does not require any priming prior to application. Instead, a straight forward, 3 step process of pouring, scooping, and compressing is all that is required. Just be sure to leave permanent patching projects to the professionals! They have the proper training, tools, and resources to deliver outstanding results that last. 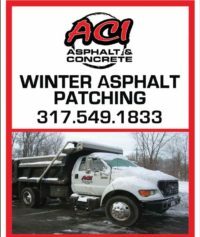 Call ACI Asphalt and Concrete Inc. at 317-549-1833 to learn more about the winter road patching and pothole repair services we provide in Indianapolis and throughout Central Indiana. Owner, Lindsey Lewis, offers a wide range of winter cold patching services for commercial, industrial, and municipal properties, and all at the most competitive prices in town. Request a free estimate, today. This entry was posted in Pot Holes, Winter Cold Patching and tagged Asphalt Pot Hole Repair, cold asphalt mix, Indianapolis pot hole repair, Indianapolis Winter Cold Patching, winter cold patching products. Bookmark the permalink.